Recommendations are almost always paid heed to. When someone tells us about how beautiful a place is or how scrumptious the food at a restaurant is, we try to check it out ourselves. Not necessarily would we always agree with recommendations from friends and family, yet we are tempted to try them even if a particular thing does not interest us. Such recommendations are termed as social recommendations. Social recommendations have taken a whole new form through the increasing popularity of web applications, such as shopping services and online sharing. In such applications, it is the interpersonal influence that is orchestrated to play a more important and critical role. Surveys say that 45 per cent mothers’ purchasing decisions are influenced by recommendations through the social media. Smartphones and tablets have made web accessibility all too easy. These gadgets help people stay connected, entertain themselves and consume and access information, irrespective of the location. Facebook, Twitter, Google Plus, Foursquare, Tumblr and other social networks have shrunk the world. Almost all mobile application help you connect and socialise on these social media websites. 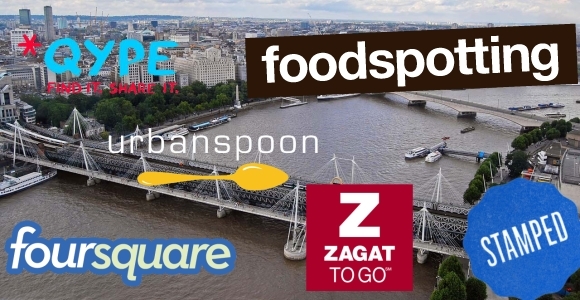 Here are some of the best social media apps and sites for exploring London. A location-based social networking website, foursquare is fast becoming a popular tool among mobile device users. It is a combination of friend-finder, competitive bar game and a city guide. Simply put, foursquare lets you ‘check-in’ to places with your phone. So when you ‘check-in’ to a theatre, your friends get an alert about your location and if they are close-by, they might come over to accompany you. So, you really liked the lasagna at the new Italian restaurant and feel that your friends should try it too. Stamp it on Stamped.com. You can recommend books, movies and everything else on this app. You’d wonder how is it different from Facebook? Stamped.com is different as it gives out only the best recommendations to its users from people they know and trust. These recommendations are called stamps and you have a limited number of stamps as you start out. When a friend thanks you for some place or thing you ‘stamped’, you get credit which helps you get more stamps. Stamped.com is a free app for iPod Touch and iPhone users currently. The largest consumer review site in Europe, Qype helps you find the best place anywhere and everywhere. Whether it is a little quaint restaurant, hidden from public sight or a local landmark, Qype finds the best places in the world in over 1000 categories. This app is free to download and you can even write comments and reviews on the go, check-in to a place and upload pictures. The powerful map tool of Qype filters the area to get you the best places everywhere. Finding the best place in a new city is easy and quick with Qype. A popular restaurant finder, Urbanspoon is another mobile application that helps you find the best dining space in your area. It even features reviews on food by critics and foodies. You can also keep a track of places you’d like to dine at in future through this app. With their new and advanced technology and features, iPad users can even book or reserve a table at a restaurant. Users can also record where and what they ate and how much they spent on Urbanspoon’s dineline. This app certainly is a delight for food lovers across the globe. While you are on the road and are looking out for a good place to grab a bite, Zagat to go is the app to fall back on. With this app, you can locate the nearest eatery and get as many as 45 recommendations every year about restaurants, the décor, service and food. You can even use this app to reserve a table. So, the next time you land at a place, use Zagat to go to make a table reservation and your dinner schedule will be set. There are many other apps that are finding a niche in the market due to their distinctive services. And with such apps and sites, exploring a new place becomes a smooth and hassle-free experience. Jonathan loves all things social and uses social reviews to guide him through every walk of life – from choosing a luxury London spa hotel (http://www.the-berkeley.co.uk/the-berkeley-spa-health-beauty.aspx) to deciding on what bagel to eat.